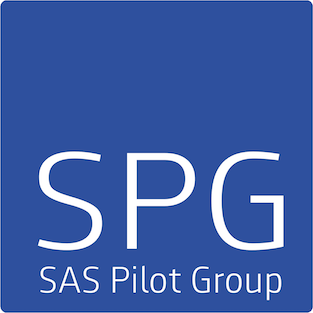 SAS Pilot Group (SPG) is a transnational pilot organization representing pilots operating for Scandinavian Airlines (SAS). SPG is founded by Dansk Pilotforening (DPF), Norske SAS-flygeres Forening (NSF), Scandinavian Norge Flygerforening (SNF) and Svensk Pilotförening (SPF). SPGs aim is to form a strong alliance of all SAS pilots through the organization. The SPG member associations will work towards the ultimate goal of SPG being the organization which will represent all Scandinavian Airlines pilots and have bargaining rights for the collective agreements for all SPG pilots.